Well for many, an Easter meal is incomplete without a Roast of some sort. Though I like the traditional Chicken Roast with stuffing, hubby is not a big fan of it, he finds it boring, does nothing for his tastebuds ;). 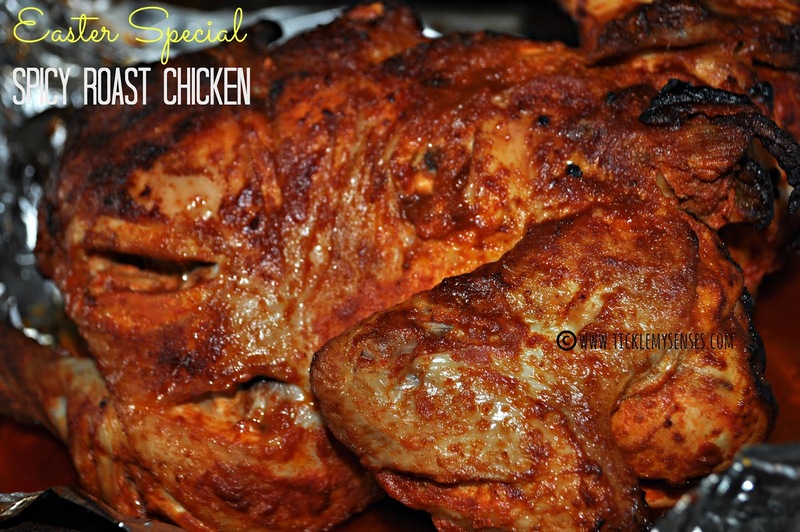 So to satisy his spicy palate I tend to make this super simple Spicy Roast Chicken as a main dish in our Easter meal. One of the things that I really like about this Roast chicken is the use of everyday spices for the marination, in addition to lemon juice/ vinegar, of course a generous amount of salt. 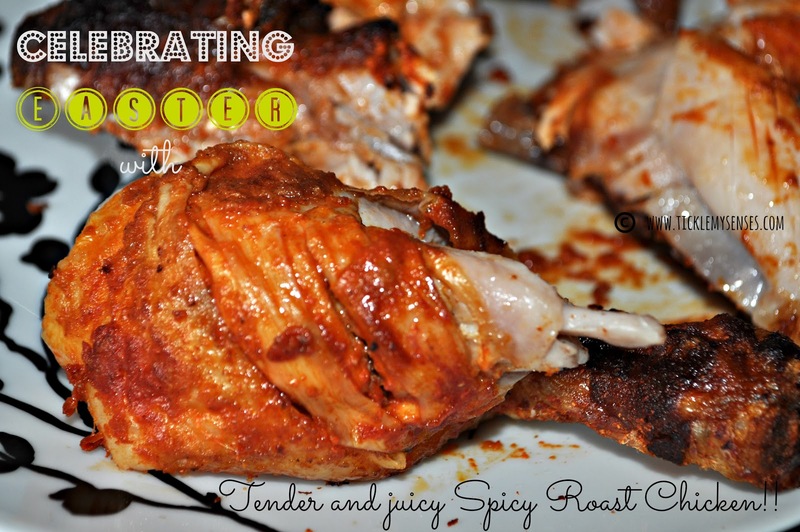 After marinating the chicken, it is roasted until it is moist and falling apart tender. Served along with roasted herb potatoes, roast vegetables and a cooling fruit n nut, Apple, Walnut, Mint and Yoghurt salad. What a meal! Serves: 4 | Preparation time: 30 minutes | Marinading time: 4-6 hours | Roasting time: 40- 60 minutes. Chicken: 1 whole 1-1.5 kilos with skin. Kashmiri Red chilli powder: 3 tsps, substitute with paprika powder for mild spice or reduce amount of chilli powder to 1 tsp for medium spice. Vinegar and salt to taste. 1. Take a whole clean chicken with skin on (the skin when left on the bird helps to preserve the juiciness and tenderness in the chicken). 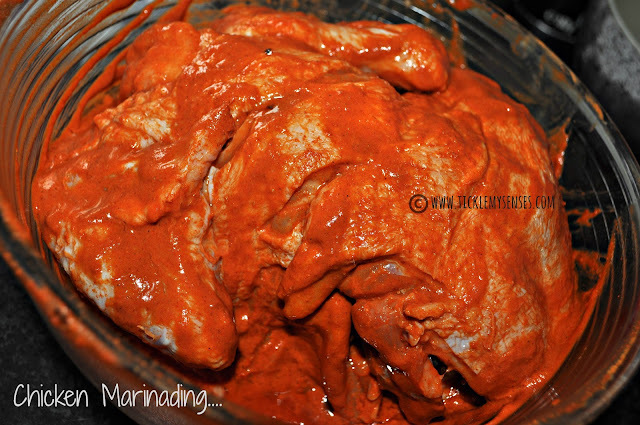 Make deep gashes all over the chicken, cuts should reach the bone ( helps the marinade to penetrate the meat better. Pour 2 tbsps of vinegar all over the slit bird and allow to stand for 5 minutes. Then dab the excess moisture from the chicken using kitchen paper and keep aside. 2. Prepare the marinade. In a large bowl mix all the ingredients for the marinade. Add salt and vinegar to taste. The salt and sourness added should be a little more, should taste like a pickle. 3. Place the chicken into the marinade bowl, using fingers push marinade into the slits and spread all over the chicken surface. Keep aside for 4-6 hours or longer to marinade. Longer the better. 4. 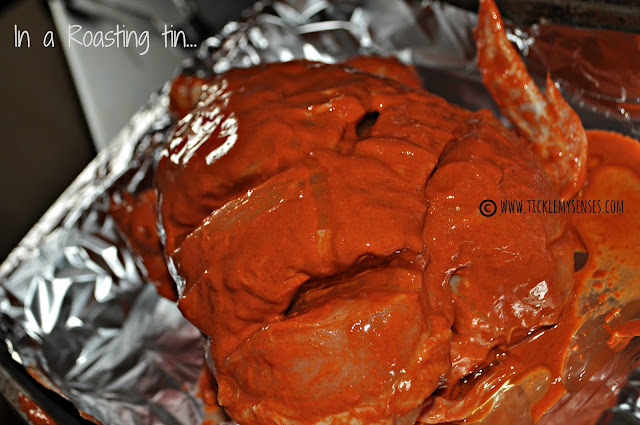 Place the marinaded chicken on a Roasting tray lined with foil. Pour over 1 tbsp of oil/ melted ghee over the marinaded chicken. 5. Place the chicken in the center of a preheated oven and bake at 200C/ 375F for 45-50 minute basting in between in its own juices and turning over once. Once cooked ( the meat should come of the bone easily, and juices should run clear). Take the chicken out of the oven and let the chicken rest in the roasting tray covered with foil, for 10 mins. Cut and serve. 7. Collect all the juices in the roasting tin a bowl, skim away excess oil, taste of seasoning, adjust. Serve as accompanying gravy. Serve with oven roasted herb potatoes and roasted vegetables, and simple nutty- fruity cooling apple, walnut and mint raitha. Pan Fried Qualis in a Spicy Pepper Marinade. Ahh this looks perfectly made & really tasty!! !